Merle RobroyAn MD practicing OB/Gyn, Dr. Robboy is a prominent orchid lecturer for the AOS. 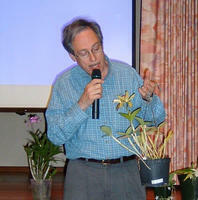 He has grown orchids over 25 years and speak for the AOS on the West coast for over 15 years. His collection has over 1500 plants, more than 1/2 are species, and are grown under shade and in a greenhouse as well. He has served as president of the So. Calif. Orchid Species Society and the Newport Harbor Orchid Society. He has a wide interest in other tropical plant types and serves as a judge in the American Dahlia Society.